While strolling through Valbonne yesterday morning, I came across what I believe is a new library (though I’ve been known to walk past this sort of thing for months without noticing). It is a lending library “pour tous” (for everyone), i.e., it’s part of a nationwide (private) initiative to encourage reading (the government is testing other ideas, such as giving college students a free subscription to a newspaper of their choice). The library has an English corner, presumably to encourage a portion of the non-French population to read more, too. 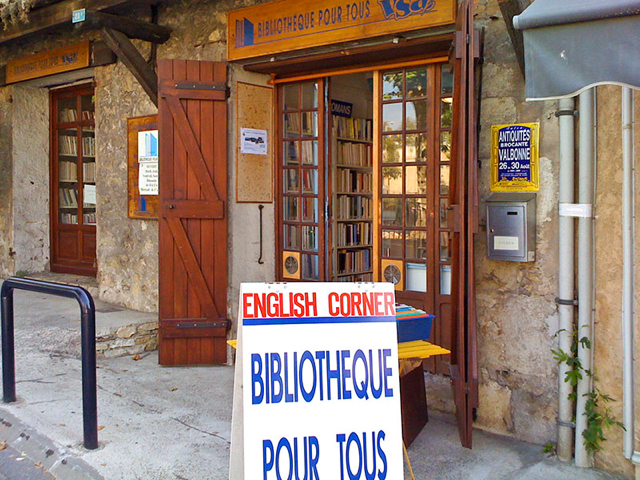 There is also an English bookstore in Valbonne; clearly, it wouldn’t be right if the French could borrow books while anglophone readers were forced to buy them. It never ceases to amaze me how many things the French get right.